While Stanley Ho (何鴻燊, 1921-) might be best known for his gambling interests in Macau, he is also a pioneer in the HK real estate industry who co-founded and later served as president of the Real Estate Developers Association of HK for many years. His first venture in HK real estate was Lee On Construction, which he co-founded with a number of partners in the 1950s and was responsible for the development of over 40 properties (many of them with “Lee” in its names) in HK in the 1960s and 1970s. The firm also had an affiliate Lee On Realty which was a listed company from 1972 to 1987. Lee On Construction was incorporated in 1957 with HK$2.5 million in capital by Stanley Ho, Fong Hin-yeung (方顯揚) and Ling Tat-tong (凌達鏜) with registered address as 33 Ko Shing Street in Sheung Wan. By that time, Stanley Ho had become a millionaire through shipbreaking and trading with Korea during the Korean War through his Agencia Commercial Progresso and had returned from Macau to HK in 1953. Fong Hin-yeung is the eldest of seven sons and as managing director of Lee On was a driving force of the firm. His father Fong Hon-cheung (方漢章) was a wealthy merchant and he was supported at Lee On in the later years by his younger brothers Fong Chung-pak (方松柏), Fong Hing-wah (方興華, deputy managing director of Lee On Realty), Fong Wing-wah (方永華) and Fong Hin-wah (方顯華) and Bill Fong Biu (方標, director of Lee On Realty) from the next generation. Born in 1926, Ling Tat-tong is a native of Whampoa in Canton who served as director of Tung Wah in 1963 and later became a casino junket operator after his business partner Stanley Ho secured the Macau casino monopoly in 1962. Two of the first projects Lee On was involved in were Yick Kwan House (益群大樓) at 248-252 Chatham Road which sold for $9000 a flat and tenement building at 5-7 Gordon Road in Causeway Bay at $10000 a flat, both of which were completed in 1958. In 1959, Lee On developed the 10-story Mountain View Court (峰景大廈) at 12 Conduit Road with three flats per floor and selling at $20000 a flat. (Stanley Ho’s own family lived in the building in the 1960s and some of his relatives such as his nephew Diego Swing lived there into the 2000s) The same year, Lee On developed the 12-story Lee On Building (利安大樓) at 56-62 Argyle Street in Mongkok with residential flats (4 bedrooms 1 living room) starting at $10000 each and shop units at $40000 each. By Stanley Ho’s own account, his wealth exceeded HK$10 million by 1959 thanks to success of Lee On and other enterprises, more than quintupled the amount he had when he moved back to HK in 1953. Building on the success of Lee On Building, Lee On built a series of buildings in Mongkok in the early 1960s. In 1960, Lee On built two buildings on Argyle Street – the 16-story Lee Kwan Building (利群大廈) at 40-46 Argyle Street where Lee On also had its Kowloon branch office and Lee Fung Building (利豐大廈) at 88-96 Argyle Street. In 1961, Lee On developed another 4 buildings in Mongkok – Lee Wah Building (利華大樓) at 738-740 Nathan Road, Lee Hing Building (利興大樓) at 107-123 Fa Yuen Street, Lee Man Building (利民大樓) at 106-116 Tung Choi Street and Lee Wai Building (利威大樓) at 654-658 Nathan Road. In 1963, Lee On relocated its head offices to the Hang Seng Bank Building on Des Voeux Road Central while keeping its office at Tak Shing House for its design & engineering department. That year, Lee On was involved in the development of 5 buildings – Lee Tat Building (利達大樓) at 785-787 Nathan Road, Lee Fat Building (利發大樓) at 38-44 Butte Street in Mongkok, Lee Shun Building (利順大樓) at 157-159 Lockhart Road in Wanchai, Lee Tai Building (利泰大樓) at 101-107 Prince Edward Road and Le Belle Mansion (利寶大廈) at 118-120 Argyle Street. In 1964, Lee On developed its highest end project since launch – Le Clare Mansion (利嘉大廈) in Pokfulam with 2000 sq ft flats and 1700 sq ft flays selling at $60 per sq ft. Based on records of the articles of incorporation of Lee On Construction’s listed affiliate Lee On Realty, Fong Hin-yeung and another Lee On director Chan Ching-pow (see article on Po Wah Land) both lived in the building. As Stanley Ho became more involved with the Macau casino and Shun Tak Holdings in HK in the 1960s, he appeared to have phased out of Lee On Construction which by the early 1970s was run by the Fong family. The Fong family was involved with Stanley Ho and Henry Fok in the founding of the Real Estate Developers Association in 1965 and the development of Star House in Tsim Sha Tsui in 1967. In 1972, the directors of Lee On Construction established Lee On Realty & Enterprises Ltd and listed the firm on the Far East and Kam Ngan exchanges through the issuance of 4.3 million new shares at HK$1 per share with the Overseas Trust Bank as underwriter, Chan Ching-pow as chairman and Fong Hin-yeung as managing director. 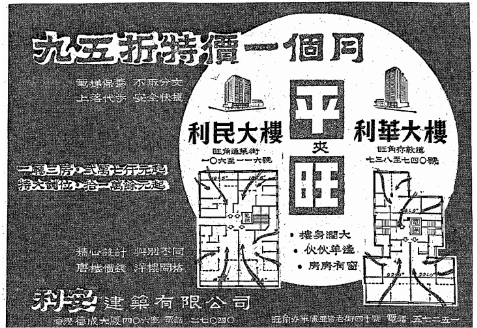 At the time, projects which Lee On Realty was involved in include the 24-story On Fat Building (安發大廈) at 28-32 Davis Street in Kennedy Town, Lee Kiu Building (利僑大廈) at 51 Jordan Road in Yaumatei and 26-story Showboat Mansion (金舫大廈) at 893-899 King’s Road in North Point built on the former site of the Showboat Restaurant & Nightclub. The projected net income for the firm at the time of listing were $1.9 million in the first year and $2.25 million in the second year. In 1979, Lee On partnered up with Cheung Kong Holdings to acquire the August Moon Hotel at 25 Kimberley Road in Tsim Sha Tsui (developed by Barbara Fok, to be covered) and re-developed it into a 18-story Cheung Lee Commercial Building (長利商業大廈). 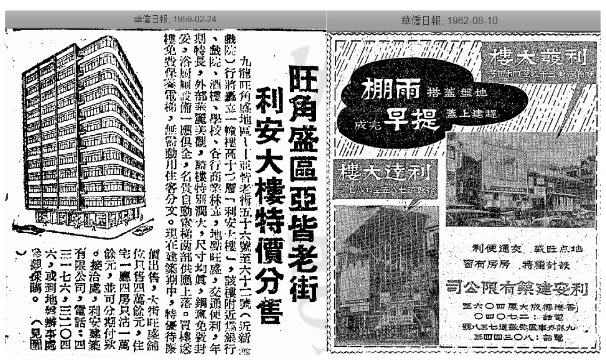 For the six months ending June 1980, the firm recorded profits of $10.76 million and the firm was involved in the development of two low rise luxury houses development – Las Pinadas (松濤苑) on Clearwater Bay Road in Sai Kung (58 units) and another project on Shouson Hill Road in HK. The firm was also involved in the development of the 24-story Luen Lee Building (聯利大廈) at 8 Lun Fat Street in Wanchai, Yardley Commercial Building (億利商業大廈) at 3 Connaught Road West in Sheung Wan, a 360 room, 20-story in Macau and projects at 53, 57 and 59 Bonham Strand East in Sheung Wan (developed into On Wing Building). In the 1970s, the Fong family and Lee On became very interested in Tai Po and the Fong family acquired 3 million sq ft of land in Sha Lo Tung (沙螺洞 nearly half the size of the area) from the villagers. The plans were to develop a golf resort with 18-hole golf course, 86 two-story houses and 14 six-story buildings but the plans had yet to come to fruition after four decades. Another piece of land (Lot 1901) which Lee On acquired in Tai Po in 1972-73 was developed into the 16-story Tai Po Commercial Centre (大埔商業中心), the first high-rise office building in Tai Po but the firm was unable to sell 70% of the units in the building when it was completed in 1982 so they became rental units instead at HK$5 per sq ft. For fiscal year 1982, the firm earned $7.67 million, a drop from $23.85 mil in the prior year. By the mid-1980s, Charles Sin Cho-chiu had replaced Chan Ching-pow as chairman of Lee On Realty while Fong Hin-yeung continued to run the show as managing director. In 1987, the board of Lee On Realty reached an agreement with Abaco Enterprise, a firm connected with Japanese business interests for which Abaco acquired 51% of Lee On for HK$172 million. The firm was renamed Yoshiya International Corporation (慶屋國際) under Japanese management and Fong Hin-yeung stayed on as a director until 1993. The firm was renamed Capital Estate Ltd (冠中地產) in 2000 when it changed hands once again. Outside of Lee On, both Fong Hin-yeung and Ling Tat-tong were pioneers in real estate and infrastructure in the mainland. In 1985, Fong Hin-yeung and a group of HK businessmen met with Madam Zhou En-lai (鄧穎超) in Guangzhou and in 1988, his group was involved in talks with the Shenzhen government regarding the development of an industrial zone in the Futian district (ultimately the government partnered with Li Ka-shing to develop the Futian area). Ling Tat-tong and Stanley Ho formed Hoi Fung Investment which partnered with the government of Sansui and built the Sansui Bridge between 1993 and 1995 at the cost of $420 million. For his contributions to the real estate development of his native Guangzhou, he was named an honorary citizen of Guangzhou in 1993. This article was first posted on 1st April 2019.